A combination of proven skin protection and a beautiful longer lasting safer suntan means SUNSELECT™’s unique selective ultra violet filter fabrics provides the wearer with the best of both worlds. SUNSELECT™ offers a comprehensive range of prints and uni-colours to complement their summer designer clothing. SUNSELECT™’s patented non-applied sun protection concept, allows the wearer to enjoy a desirable suntan in absolute comfort both for body and mind. “SunSelect” swimwear and outerwear offers the ideal skin protection combined with a safer way to sun tan. 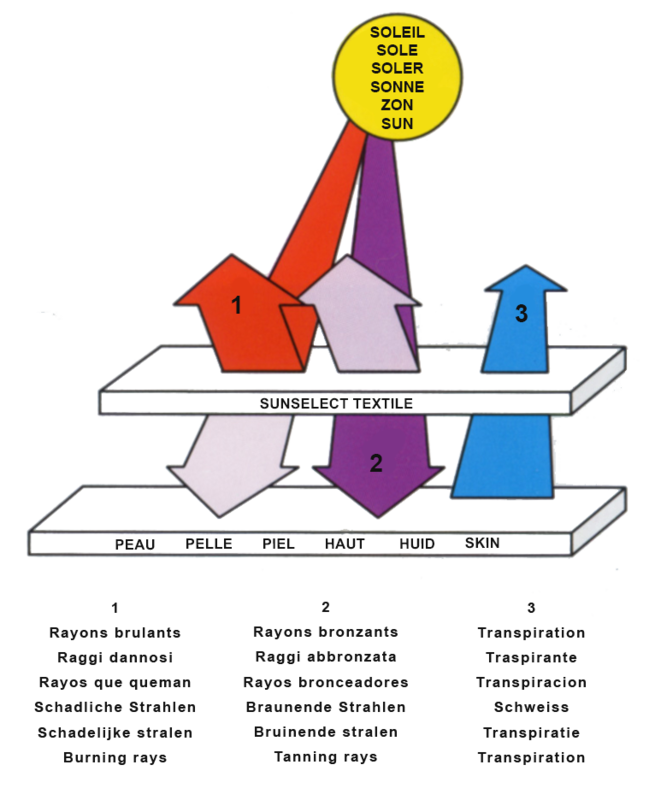 “SunSelect” textile is a patented and scientifically developed fabric, that filters most of the dangerous UV-B rays, but selectively transmits the tanning UV-A rays through to the skin. How can SunSelect fabric be a selective UV filter? SunSelect fabrics are knitted and finished in a controlled and specific way. The finishing controls the size and amount of microscopic holes in the fabric. These microscopic holes allow a prejudged amount of the required ultra violet-B through to the skin’s surface. The amount allowed through is based on known medical and scientific data. Tanning takes place, but burning is prevented. Thus we have a preselected amounts of both ultra violet wavelengths in a perfect combination to provide a golden suntan. Consumers when wearing a “SunSelect” swimsuit or garment must expect two results. 1.They must not experience any discomfort through skin burning. 2. They must after a sensible period of time see a darkening of the skin’s colour. To avoid the skin burning, SunSelect builds into the transmitting filtering effect, a protection factor of at least 8. This is achieved by only allowing a small percentage of the burning UV-B rays through the fabric. Unlike creams, oils and lotion which rub off, wash off, etc.,SunSelect’s protection is absolute and constant. It would be totally irresponsible of SunSelect to offer something that could potentially cause pain and more serious long term damage. taking 1 and 2 above into consideration, we must understand what is now required for the wearer to suntan underneath the fabric. First and most importantly, the wearer must spend at least 6 hours in one day exposed to bright sunlight early in their holiday period. On ins[ection of the skin it will be noticed that it is slightly pink in colour, which is the beginning of the tanning process. Each day after, provided the exposure time is adhered to, the skin will darken into brown golden suntan. SunSelect is not a miracle, but it is a scientific invention which, if used correctly, will give the wearer the result they expect.